For a while I had wanted to dabble in calligraphy, and I finally did it. The start-up cost was very low, a reduced-price book which contained guides as well as art paper to get some practice, and some broad tip markers of widths 2.0mm, 2.5mm, and 3.0mm. The tips were different from regular chisel tip markers in that they are not slanted, but straight. 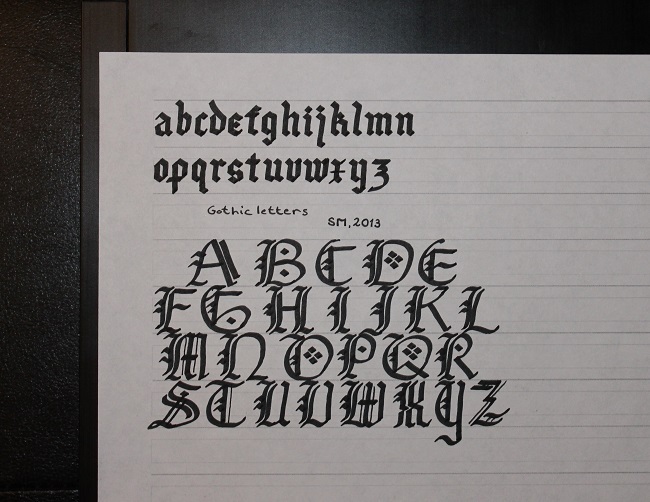 I started with the Gothic script (also called Gothic hand), and within days, I was writing letters! The markers are nice and cheap, but it's hard to get really sharp edges, and the so-called "hairlines" which can be used to decorate the text. One thing I noticed is that there are many variations of this style, and really no de facto Gothic. So I did something similar, and created a hybrid of the styles I liked the most, and created my own, below. One other useful tool I found was ruled paper. There are websites which can generate ruled paper with customizable height, etc. I've included below the template I used for the 2.0mm, 2.5mm, and 3.0mm tip width markers. 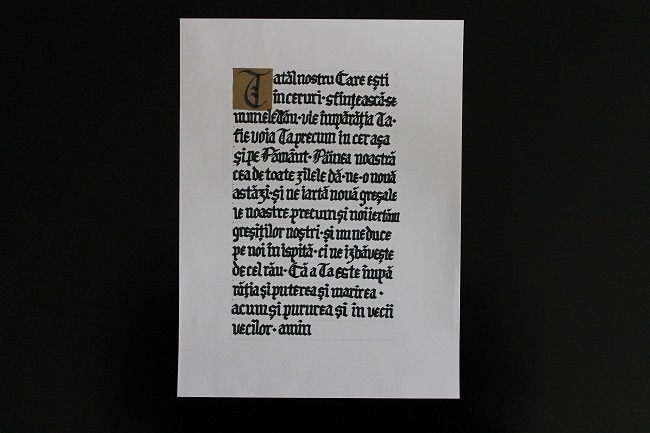 Using a metallic gold-coloured permanent marker, I was able to add a bit of illumination to the first capital, in the one-page work I've done below (the text is in Romanian).